I was intrigued when I saw this recipe in the magazine. No butter, no sugar and no eggs! Using just a pinch of salt is all the seasoning used for this cookie. This is very suitable for those whose health does not permit them to consume sugar and fat, but I suppose kids will not like to eat this cookie which is not sweet at all. The first batch of cookies were rolled out too thinly, resulting in them being too crumbly. They sort of like disintegrate when I shifted them around. So, for subsequent batches, I rolled out the dough to a thickness of at least 3/4cm for easier handling. The result was better. The cookies were firmer, but still, you've got to handle them with care! So without sugar, butter and eggs, how was the taste like ? Well, my hubby said it was bland. He prefers his cookies sweet. 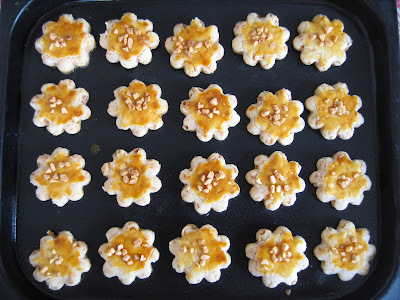 My youngest son did not try this at all because he was only hankering for pineapple tarts and more pineapple tarts! However, I personally find the taste very natural with just a hint of saltiness. The almonds were very crunchy and fragrant with every bite. I like them! 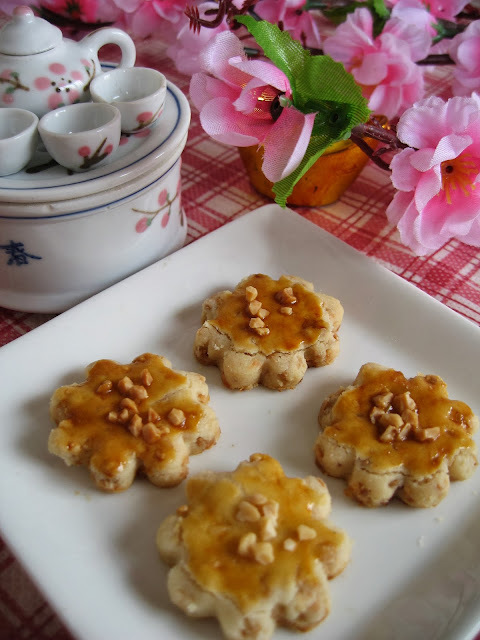 Perhaps, you need to acquire a taste for these sugarless cookies. 1. Place all the ingredients in a big mixing bowl. Combine well to form a dough. 2. 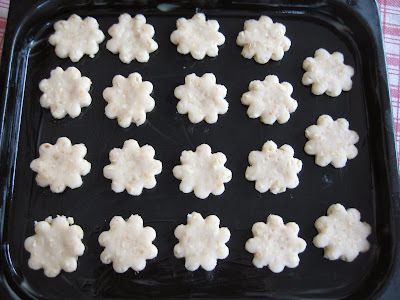 Roll out the dough to thickness of about 3/4 cm and cut into desired shapes using cookie cutter. 3. 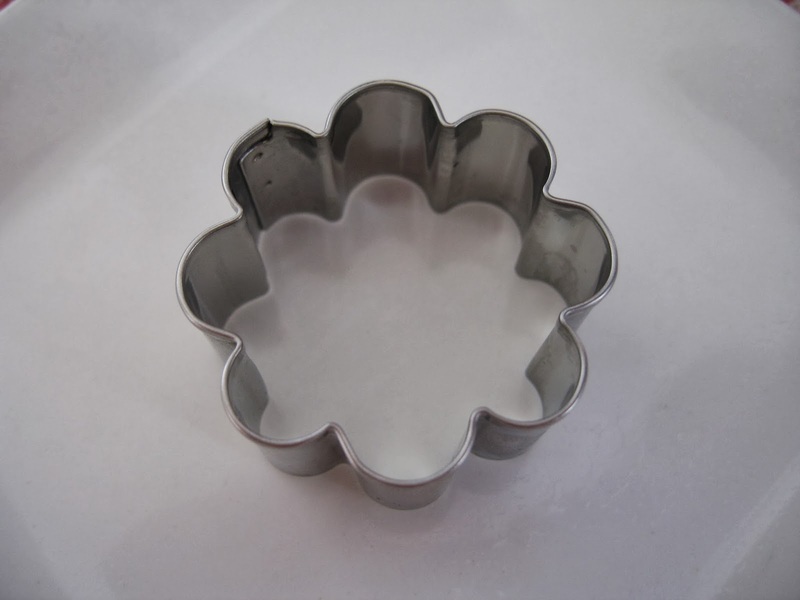 Arrange on lined baking trays or greased baking trays. 4. Glaze with egg yolk and sprinkle some almond nibs on top. 5. Bake in a preheated oven at 170 degree C for 15 to 20 minutes or until golden. 6. Cool well and store in air-tight containers. Interesting cookie, being sugarless. I do not like overly sweet bakes, but am not sure about no sugar at all! Really great for those who are cutting down on sugar intake. You could eat these without all that guilt ! 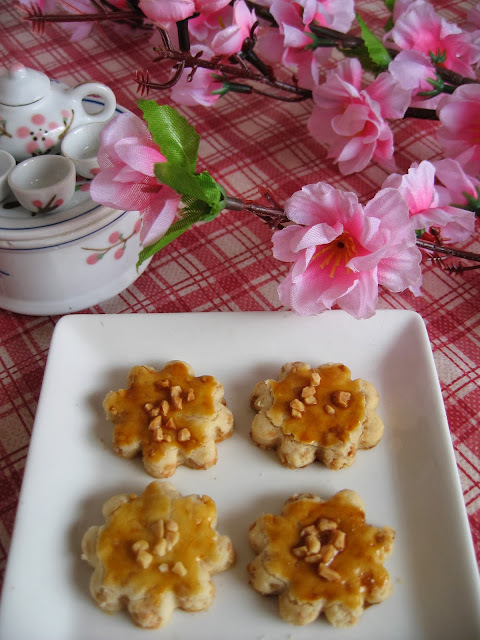 Thanks for linking this lovely recipe! 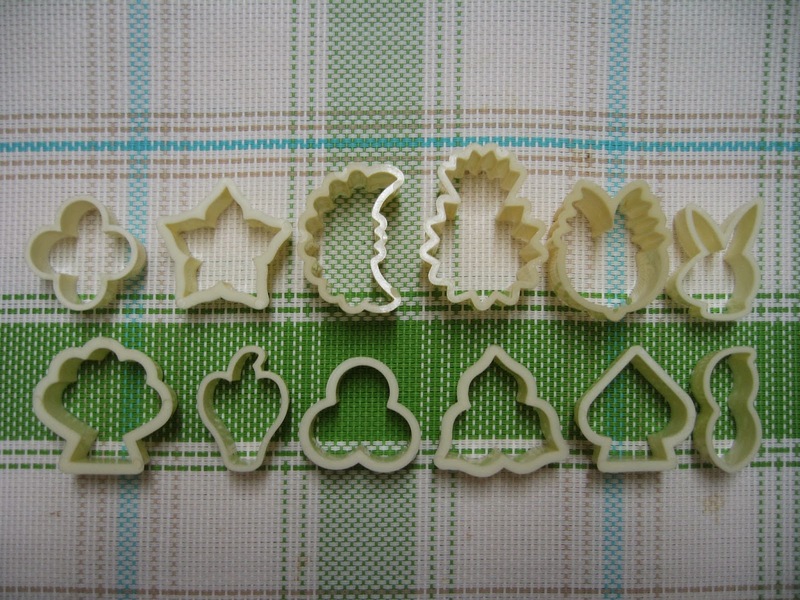 Hi Doris, what a huge range of cookie cutters you have! These are the perfect cookies for those who have specific health concern! No butter, no sugar, great for the waistline ! Will bookmark this, thanks for sharing. even tho no butter and sugar, as long as it tasty, good enuf :) thx for linking a great healthy cookie! 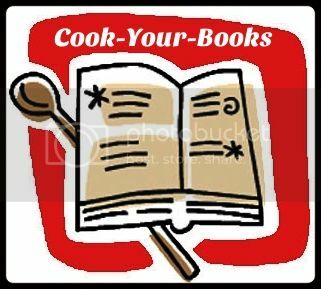 There is NO butter, sugar and eggs in this recipe!!! Oh... I can make this my diabetic friend!!! Nice to know that it is vegan too!! Interesting to see a cookie with no sugar.... I wonder if it can still be called a cookie. Hehe!